1. EzeScan 4.3.62 and higher has been tested to work with the Contex NextImage TWAIN 32 bit driver. 2. You must purchase the NextImage Software when you buy your Contex scanner. 3. The NextImage software should be supplied with a NextImage Serial Number. 4. When you first install the NextImage software you can enter this serial number to fully activate the software, or you can skip entering the serial number and the software operates in an evaluation mode for N number of days. 5. After installing the NextImage software, start the software and attempt to scan using that software. The scanner should work within the NextImage software before you attempt to use it with EzeScan. 6. Install EzeScan onto the PC that the NextImage Software is installed on. 7. 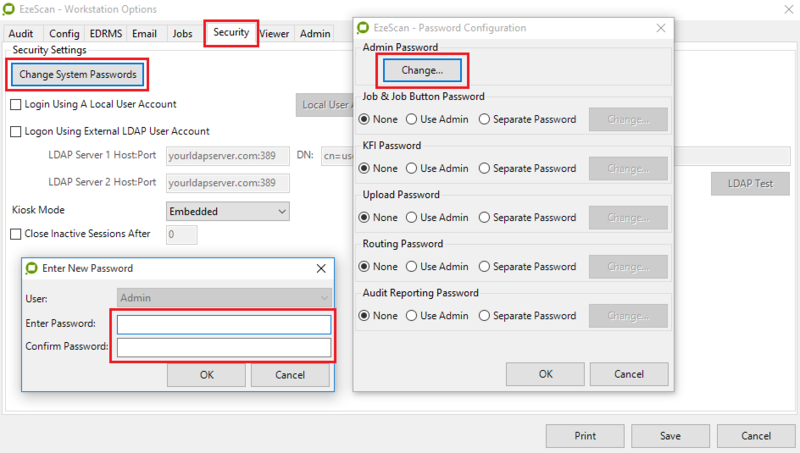 Configure a scanning job (F6 or Admin->Job Admin). On the scan tab press the 'Select Scanner' button. Choose the 'NextImage Twain 32bit' driver. 9. 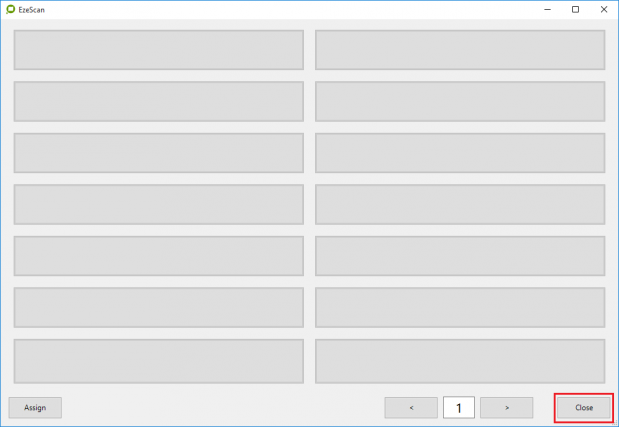 Change the Data Source Manager Version from 'Latest' to '1.X'. Apply and save that change. 10. Press the 'Select Scanner' button again. Notice the NextImage Twain 32bit driver now shows it 1.801 version number. You now have the correct TWAIN driver configured to allow EzeScan to talk to the Contex scanner. 11. On the job admin form press the 'Scan' button. Configure your desired scan settings, and then press the Green Scan button. The page is scanned. The NextImage Software TWAIN UI closes and the scanned image is returned to the EzeScan Viewer. 13. If you want EzeScan TWAIN UI settings to be passed across the NextImage TWAIN UI, on the Job admin form tick on the 'Use UI Settings shown below' tick box. 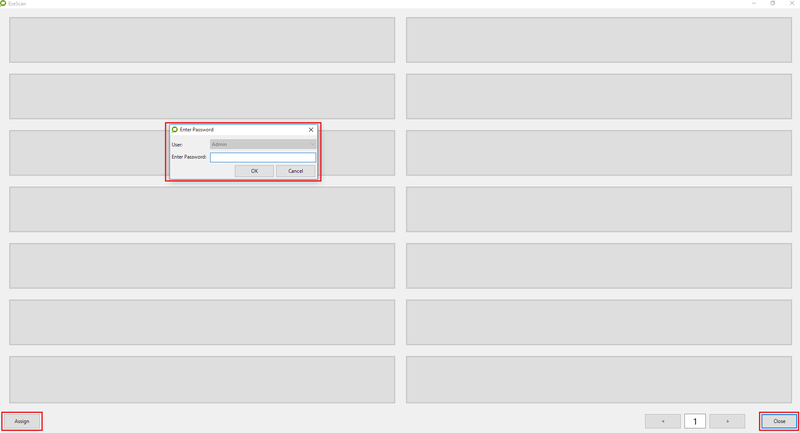 Doing so forces these settings below across to the NextImage TWAIN UI. It also automatically presses the NextImage TWAIN UI green 'Scan' button as soon as the NextImage TWAIN UI is shown. 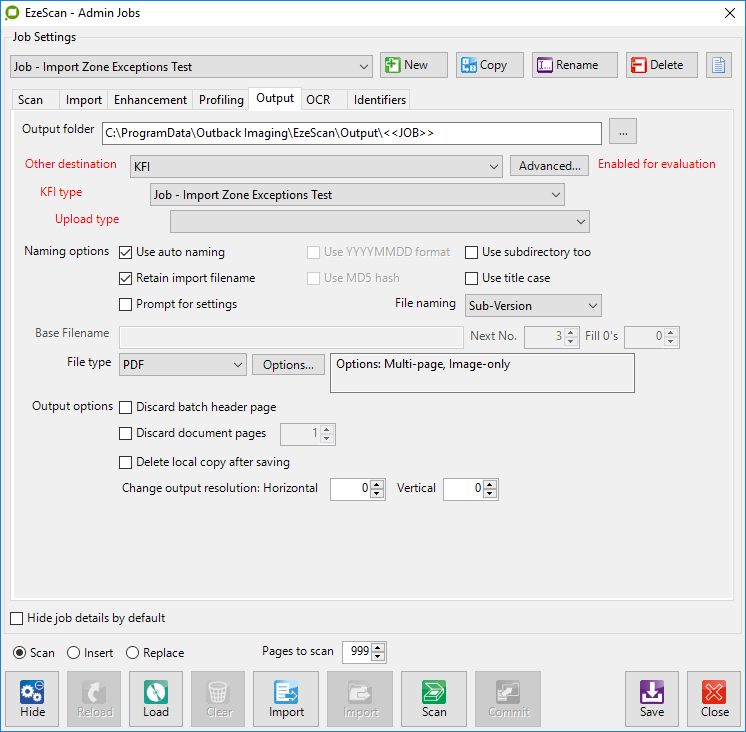 So you will need to make sure your paper is loaded, before pressing Scan on the EzeScan Job Admin form. 14. If you are scanning lots of documents on your Contex scanner, you might also like to untick the 'Close after scan end' tick box option on the Job Admin Form. This will force EzeScan to keep NextImage TWAIN UI showing after the first and subsequent scans. Saves time re-launching the NextImage TWAIN UI from scratch for each new document. If you use this option you might also like to consider using the 'Auto-Append with delay (sec)' option. 15. With 'Close after scan ends' unticked, 'Auto-append with delay (sec)' ticked, and delay = 0 seconds the NextImage TWAIN UI re-launches immediately after the previous scan has passed the image to EzeScan. To cancel further scanning press the the X in the top right hand corner of the NextImage TWAIN UI window. 16. With 'Close after scan ends' unticked, 'Auto-append with delay (sec)' ticked, and delay = N seconds (for example 30 seconds) the NextImage TWAIN UI re-launches 30 seconds after the previous scan has passed the image to EzeScan.The user is presented with a Cancel dialog during the 30 second wait period, which allows to cancel the continuous scan of documents. 17. With 'Close after scan ends' unticked, 'Auto-append with delay (sec)' ticked, and delay = -1 seconds , a Scan/Cancel dialog is displayed. The operator loads the next page into the Contex scanner and presses the 'Scan' button, the NextImage TWAIN UI launches and the document is scanned. Otherwise if they have finished scanning. they press the 'Cancel' button. Embedded mode is designed to be used on a Windows PC or Windows AIO (All In One) device with a touch screen display with a USB connected TWAIN /ISIS compliant scanner attached. a) editing the workstation configuration settings (requires an admin password). b) exiting the application (requires an admin password). c) browsing the local C: drive of the PC. This guide will help you get Embedded Mode setup on your EzeScan installation (please click any of the images below to zoom in). It is assumed that you have read the EzeScan Job, Indexing and Upload User Guides and are familiar with navigating around in EzeScan between the various Admin menus. 2. Once the software is installed you will need to install a license to activate it. Once you have a license (evaluation or production) then use the Admin->Licensing menu option to launch the following form. Use the import button to import the license file. Then restart the software to activate the license. 5. Now you'll want to enable Embedded mode. This can be found under Admin -> Workstation Options -> Security tab. Select Embedded from the “Kiosk Mode” dropdown list. The Embedded mode features a secure interface allowing the user to access job buttons only. It also features larger buttons as well as the ability to open the On Screen Keyboard, this is essential for touch-screen devices. 7. You'll now notice that when you try to access the Assign button or click the close button on the jobs page that a password prompt will appear. 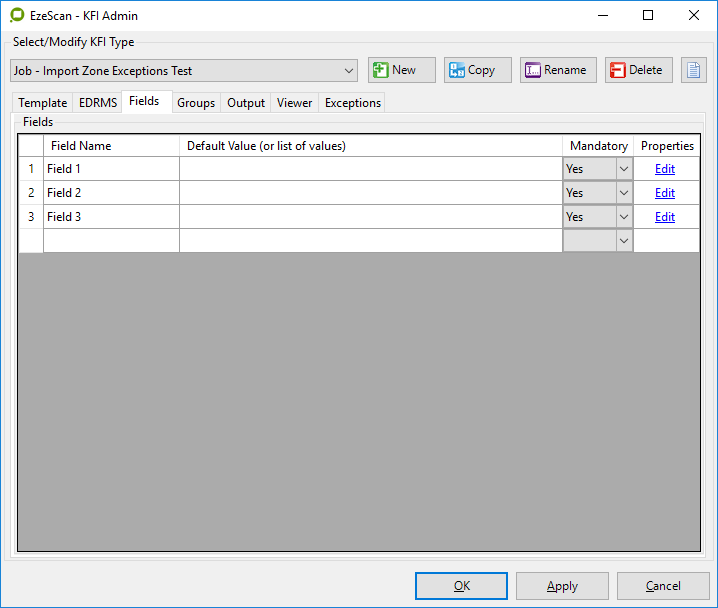 By default, there is no password set for admin so clicking OK will allow you to access the admin features of EzeScan. You will need to set an Admin password to stop your general users from changing the configuration settings. Go into Admin -> Workstation Options -> Security Tab then click the “Change System Passwords” button. There’s a button to Change the Admin password, click it then enter in your new password in both fields. Press OK to save the new password. Press OK to close the Password Configuration form. Press OK to close the Workstation Options form. 9. 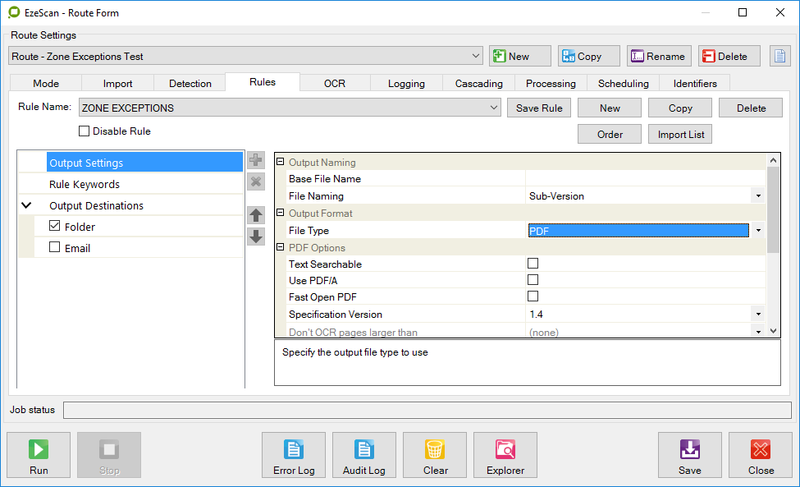 When you’re processing a scanned document and running Key Field Index (KFI) on it, the user should not have access to some of the options while in embedded mode. To access the KFI settings, go to Admin -> KFI -> Viewer tab. When EzeScan starts up in Embedded mode and the device doesn't have a keyboard present, the On Screen Keyboard (OSK) should be used. EzeScan can be set to start up the OSK with launching EzeScan. 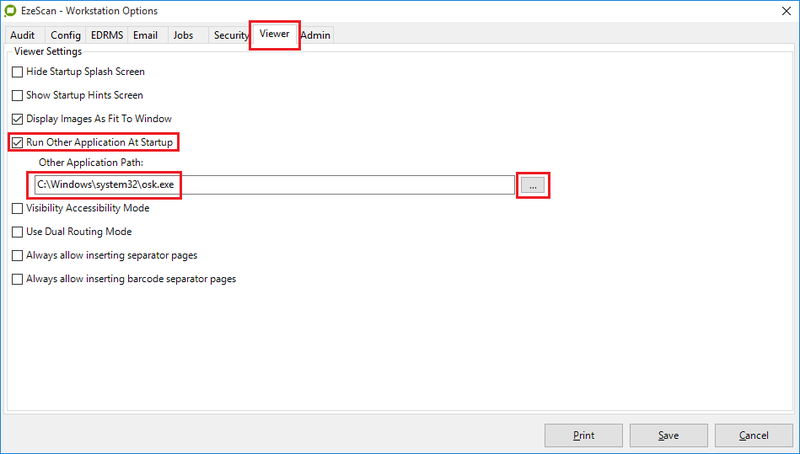 To do this go to Admin -> Workstation Options -> Viewer tab and tick "Run Other Applications at Startup". This will allow the "Other Application Path" field underneath to be modified, click the button with the three dots beside this field to find the executable to launch. In the browse window after clicking this button, navigate to "C:\Windows\system32\osk.exe" and click "Open". Once this path is set in the field, click the "Save" button on the workstation options page. The following button will appear on the main viewer toolbar. 11. Here's what the EzeScan Viewer looks like in Embedded mode. Press the Profile button on the toolbar to profile the document. You will see them those questions displayed to either the left for right of the scanned image. You can modify the size of the indexing list panels field labels and text box font sizes in the KFI Admin form as shown below. The indexing list panels field labels, text box font sizes and buttons are shown bigger in the screenshot below. The company file link in EzeScan may no longer be valid after the company file is archived, renamed, or upgraded. 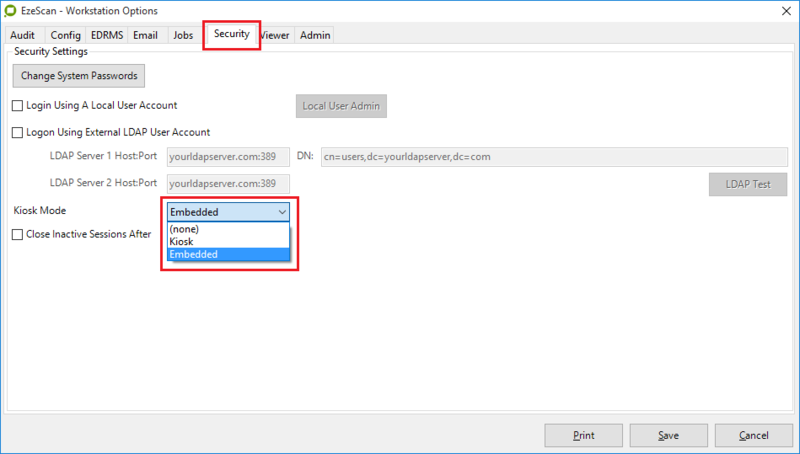 To resolve this, the company file must be reselected in the MYOB AccountRight connection settings. Tune the following four settings to suit your specific needs. These settings interact with, and sometimes counteract each other, so start with something simple and refine the settings as needed. RESOLUTION: 300 X 300 DPI is the normal recommended resolution setting. Typically, you should not have to go higher than this DPI – even for OCR needs. Increasing the resolution increases the size of the image. BRIGHTNESS: Controls the balance of light and dark shades in your image. By increasing brightness, you can actually discard objects on the scanned image. CONTRAST: Refers to the range between the darkest pixel and the lightest pixel in an image. Increasing the contrast can make objects on the scanned page stand out more, thus contrast is desirable for barcode scanning / OCR applications. Too much contrast can increase artifacts and noise found on the page, so increase it carefully. THRESHOLD: Defines the darkness level an object must be to register on the scanned image. The higher the number, the darker the object must be to register. This is the key parameter of tuning out colored paper. Threshold can be a little confusing – just remember that a lower number = more dark, so to make the scanner not see colored paper, lower the number. Changing it from 128 to 90 is a good place to start. 135. Using EzeScan Desktop To Process EzeScan Server Exceptions. In the example below we build a simple EzeScan Server Route+KFI to auto process documents. We also build an EzeScan Desktop Job+KFI to handle the exceptions generated by the Route+KFI. 1.Here’s how we setup the KFI that the ROUTE will use. First we created a KFI that would be used during the ROUTE processing to capture 3 fields of data. Then we added 3 fields to that KFI. All were numeric and Mandatory. Assigned some default number values to fields 1 (123) and 2 (456) and left the third field blank. The blank field should force an exception during the ROUTE processing. This should force the document to be handled as an exception, and send it to the Routes exception directory instead of the Routes normal output directory. On KFI admin Exceptions tab we ticked ‘Auto reroute data exceptions on submit’. This allows an exception to be detected on any field, but the exception to be handled at the end of processing all fields. This ensures that will get all of the CSV output data from the KFI fed into the output CSF file that will be imported by the JOB+KFI for operator assisted exception processing. 2.Here’s how is setup the ROUTE and linked to its KFI. Press F9 to start the Route form. On the Mode tab, set the Mode to ‘Route using a KFI Filed value’ option and chose the KFI that the Route will use to capture its field data. 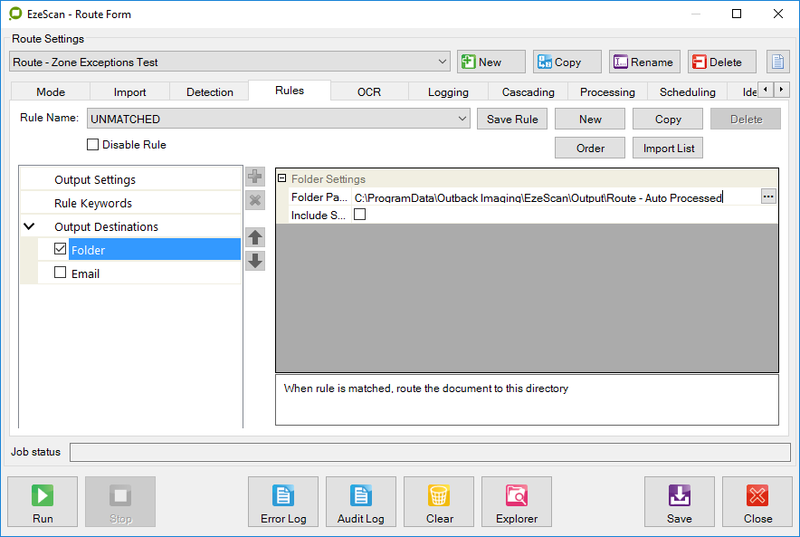 On the Rules tab, used the UNMATCHED RULE output settings to setup the directory where the successfully processed route output files are sent (i.e. those with no field exceptions) (e.g. C:\ProgramData\Outback Imaging\EzeScan\Output\Route - Auto Processed). We are sending an output PDF file and a CSV metadata file to this output folder. On the Rules tab, add a special rule called ZONE EXCEPTIONS. Set the output folder path of this rule to be the same as the import folder used by your JOB+KFI (e.g. 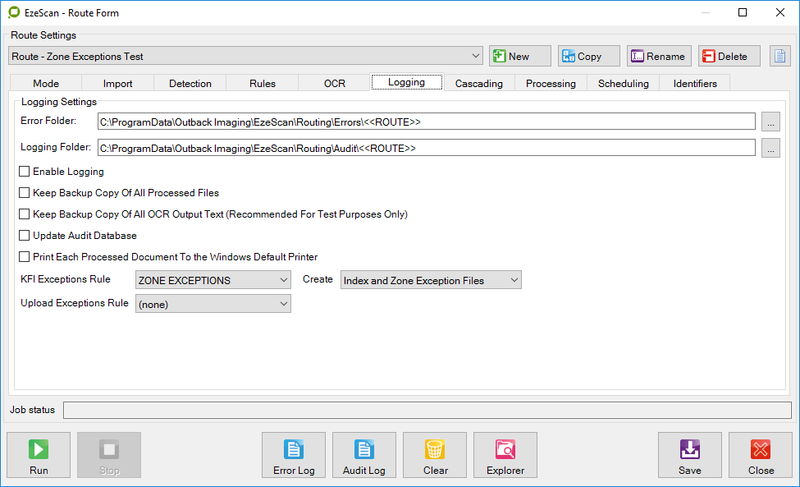 C:\ProgramData\Outback Imaging\EzeScan\Input\Job - Import Zone Exceptions Test). 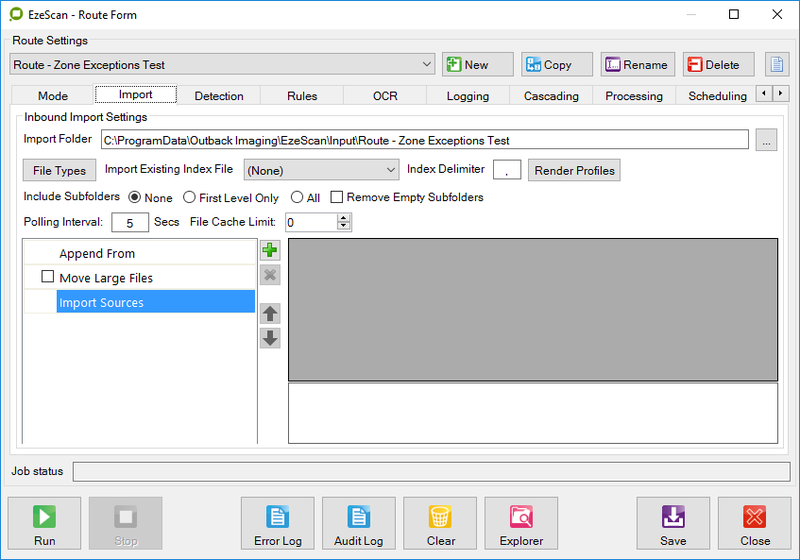 On the Logging tab set the KFI exceptions rule = ZONE EXCEPTIONS and set Create ‘Index and Zone Exception Files’. Use the Select Order button to launch the Route Cascade Order form and make sure your route is at the top of the list as the only route selected on the form. The route is now configured. You are now ready to test that the route does generate an exception file. And paste it into the routes import folder. On the Route Admin form, run the route. Press the Green Run/Play button. The sample.tif file is imported and processed by the route. An exception occurs because the 3rd KFI field was blank. The following output data was generated in the ZONE EXCEPTIONS rule output folder. It generates a TIF only because the ZONE EXCEPTIONS rule is set to generate a TIF. 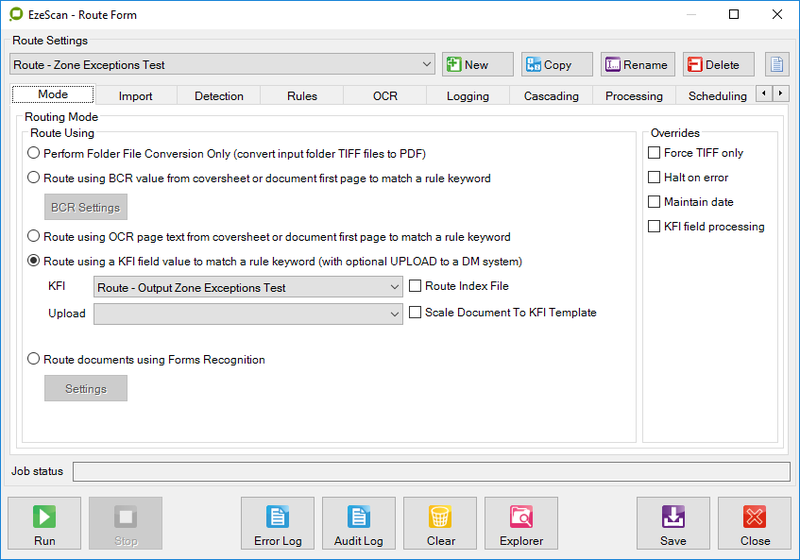 You could change it to generate a PDF by altering the ZONE Exceptions Rule output destination file type to PDF. Re-import the sample.tif, re run the Route and you would now get the exception image as a PDF instead of a TIF. 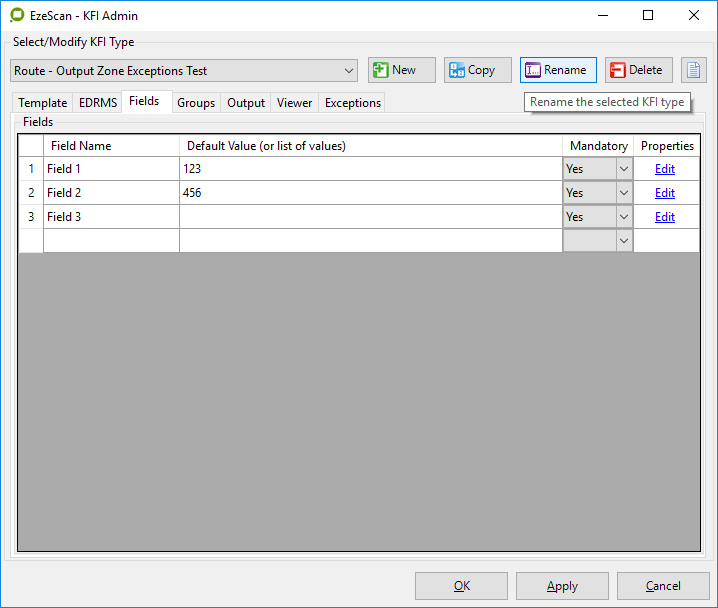 If you are processing the exceptions with an EzeScan Desktop Job+KFI then we recommend keeping the exception image as a TIF as it makes processing faster. This is due to the fact that EzeScan Desktop works natively with TIF, so any PDF”s have to be converted back to TIF before processing can start. That’s the Route part of this exceptions processing sample finished. Don’t forget to setup the KFI properly for production use. Remove the default values and exception values that were used to test the exception processing behaviour, and configure the fields for production use. Start EzeScan. Press F6 to launch the Job Admin form. Press the New Button to create a new Job. Set the index File Type = Verify KFI. Tick the Import Zone Exceptions option. 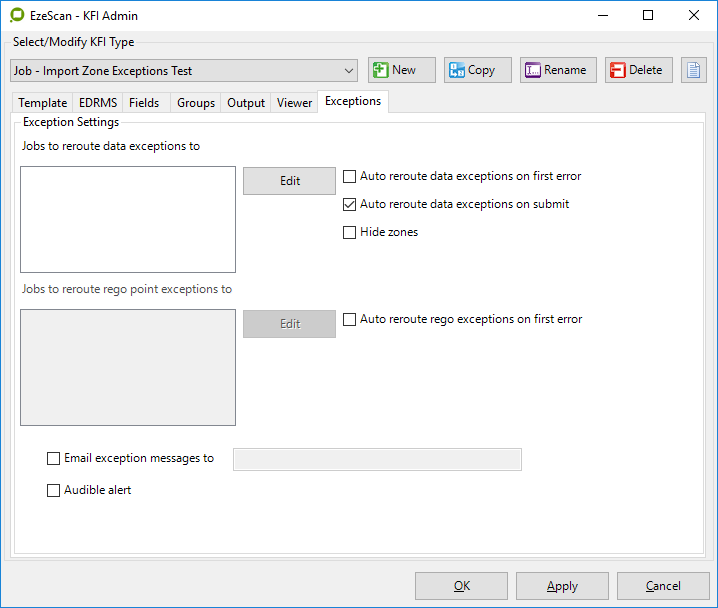 Make sure the import folder matches the directory location you used for the Route ZONE EXCEPTIONS rule output directory. Save and close the Job Admin form. Press F7 to launch the KFI admin form. 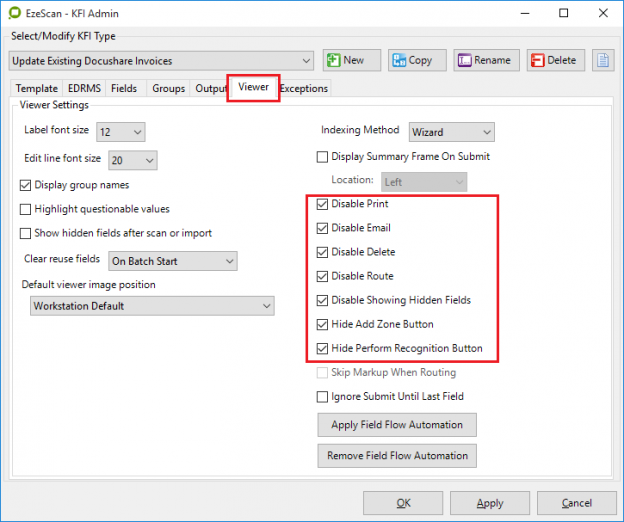 Create the same 3 fields you used in the Route KFI. But this time don’t set the default values. 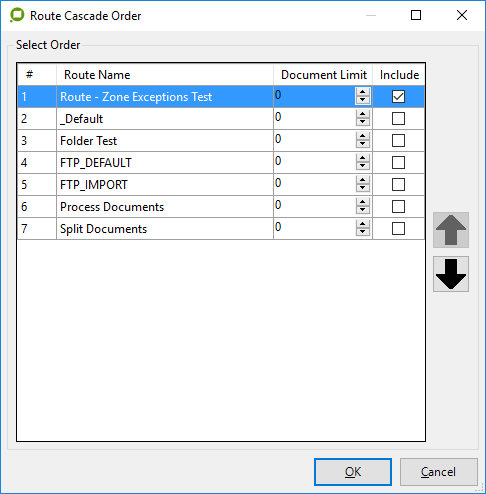 The values will be imported from the CSV .txt file (that belongs with each TIF or PDF file) that were generated by the Route ZONE Exceptions rule. Press OK to close and save the changes. Press F6 to launch the Job Admin form. Then set the KFI Type to match the KFI name that was created for the Job to use. 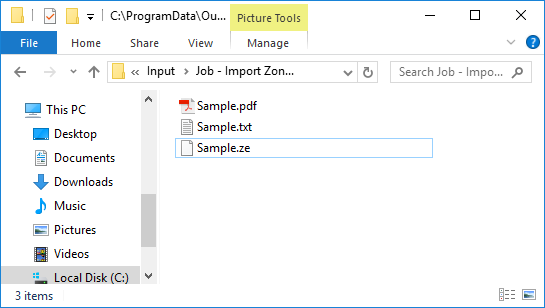 Select the output File Type as PDF. Save these settings. You are now ready to run this Job+KFI. On the Job Admin form press the Import button. Select the Sample.tif exception image. (Note the import directory does include the Sample.txt file and Sample.ze file, it’s just that the filter is restricted to showing only image type documents). The exception image is loaded into the EzeScan Desktop viewer. Press F4 to profile the document. 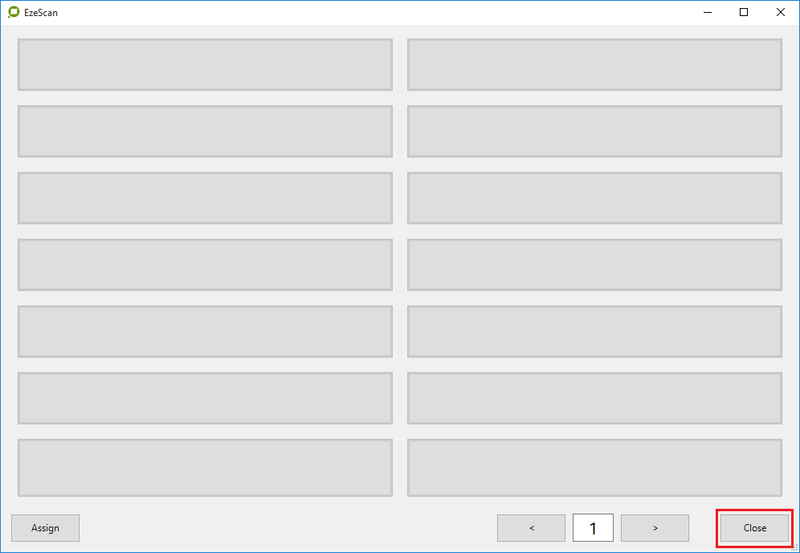 The list indexing panel is displayed. The values in fields 1 (123) and 2 (456) have been read from the CSV Sample.txt file that accompanied the exception image Sample.tif. Once the field data is updated and verified the operator presses the Submit button. 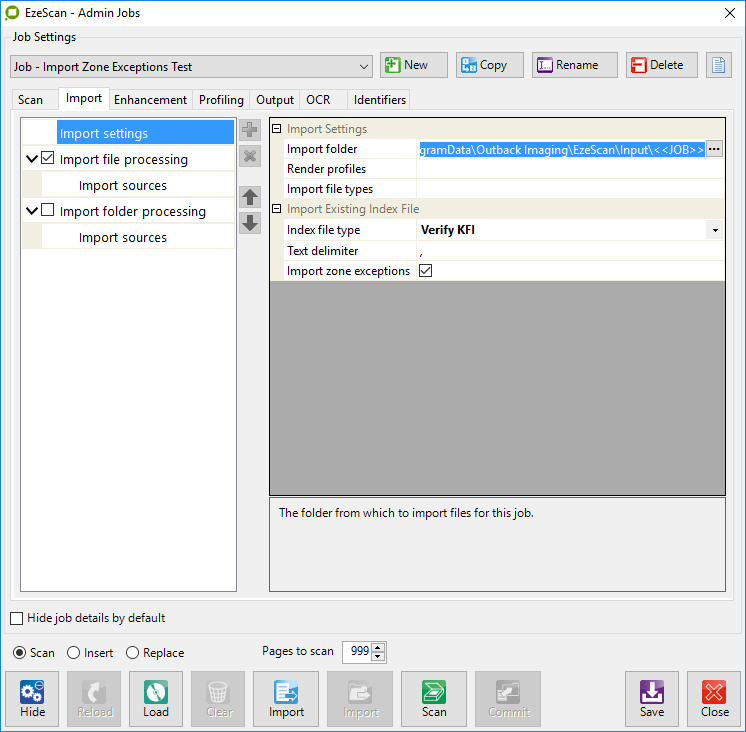 A PDF file and CSV file are then written into the job’s output folder. This is a simple example of how to set a Route+KFI with exception handing, and then using a Job+KFI to allow a data entry to finish the data entry for each exception document. In production the KFI used will most likely have more fields, and those fields will be deriving their values using a recognition engine (OCR, BCR) or Discovery. You could easily replace the EzeScan Desktop Job+KFI with an EzeScan RIA Webapp to perform the exception document handling. 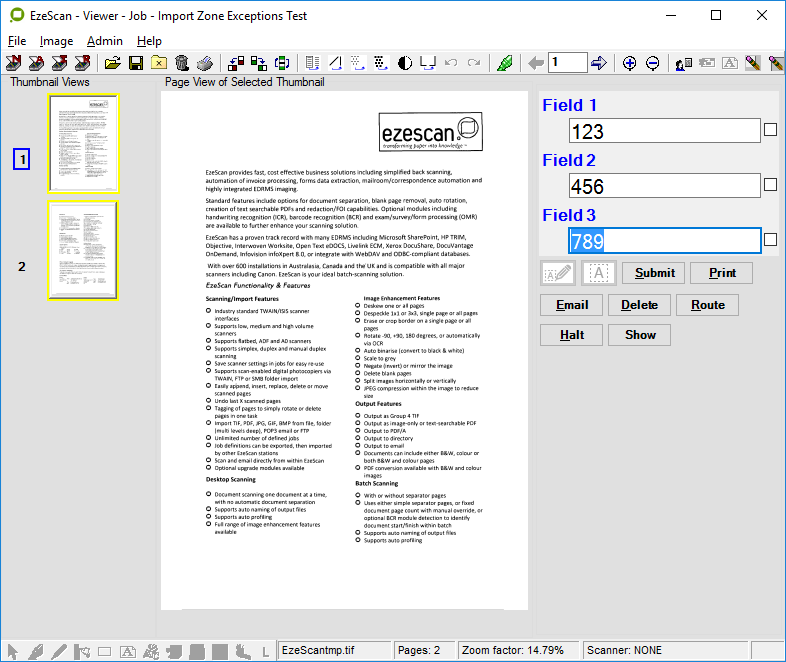 The EzeScan Desktop application can be configured to use TWAIN, ISIS of WIA scanner drivers. Scanner Manufacturer's make their own decisions as to which of these drivers they will release and support for each scanner they sell. Consequently, some scanners support TWAIN only, ISIS only or WIA only. Others scanners will support a mixture of these drivers (TWAIN and WIA, or TWAIN and ISIS, or WIA and ISIS). Whilst some scanners will support all 3 of these drivers (TWAIN, ISIS and WIA). With so many options to choose from , we are often asked by our customers what's better TWAIN, ISIS or WIA? Here's our recommendations based on implementing TWAIN, ISIS and WIA scanner drivers at thousands of our customers sites since 2002. TWAIN is written by the TWAIN Working Group. The TWAIN Working Group is made up of scanning hardware and software vendors that have a common goal of continually developing and improving the TWAIN platform. TWAIN is the most widely shipped scanner driver by most scanning hardware and software vendors. TWAIN is now supporting high speed scanning. It performs well on scanners that scan at up to 200 PPM. Based on our past experience TWAIN drivers are robust. For these reasons, we'd give TWAIN a 5 star rating out of 5. ISIS was originally created by a company called Pixel Translations. ISIS is now owned by EMC. There is often a charge associated with developing and also using the ISIS drivers.Scanner manufacturers have to pay EMC to develop the ISIS drivers for their scanners. This often means that updates to ISIS drivers are infrequent because the scanner vendors don't seem to want to pay for driver fixes or updates. ISIS is high speed and often claimed to be faster than TWAIN. In our testing we have found that it's not significantly faster than TWAIN. The ISIS UI often exposes less functionality than the equivalent TWAIN UI does. This can be quite frustrating for scanner operators when a particular setting is not exposed in the ISIS UI. If an ISIS driver is broken it can be difficult to get the issue fixed quickly. Some scanner vendors now include ISIS drivers for free, whilst others may charge extra for an ISIS driver, or charge tiered pricing for that ISIS driver as the size and speed of the scanners increases. Based on our past experience we think that ISIS drivers are slightly less robust than TWAIN drivers. For these reasons, we'd give ISIS a 4 star rating out of 5. 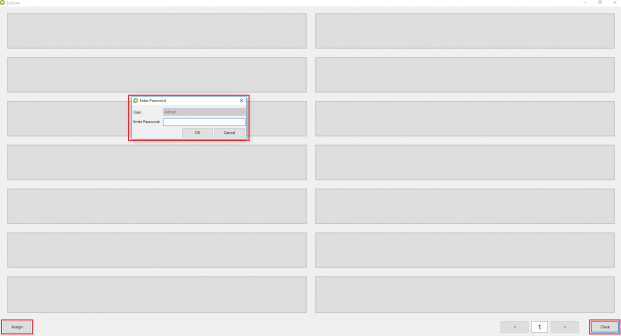 Windows Image Acquisition is an entry level driver interface support natively by Microsoft Windows. Designed primarily for use with digital cameras and SOHO scanning devices. It only runs on Windows. WIA is not functionally rich like TWAIN and ISIS. WIA is bare bones and just presents enough settings in the UI to get the scanner to perform a simple scan of one of more pages. When it doesn't work it's often hard to get the vendors to quickly fix a WIA driver issue. If it's the only scanner driver provided with your scanner then use it, otherwise we would recommend you to try TWAIN or ISIS drivers instead. For production scanning use, we'd give WIA a 1 star rating out of 5. We were testing one of our Kodak i4200's. It would scan the first page but immediately jam with that 1st page stuck in the scanner throat. The scanner displayed a U8 error on its front panel. a) made sure the paper throat path in the scanner was completely clear of any debris (e.g... paper, torn paper, staples). b) inspected the main paper feed drive rollers for damage or being worn down. c) checked that all paper exit rollers spin freely. d) tried a different piece of paper to test with. e) looked in the scanner user guide, said it was a multi-feed error. But since we were only scanning 1 page we thought how could this be a multi-feed error? Everything looked okay, but we kept getting the U8 error. The first scanned page would feed through the feed rollers but come to a stop just after passing through the main feed drive roller. We noticed that when we pressed in the paper thickness lever on the lower left hand front corner of the scanner, the scanner would scan okay. So we spent ages looking at the lower grey brake roller and how it was sitting. Concluded that even though it was tight and hardly rolled that was pretty much how it feels on other i4200's that don't exhibit the same problem. During our tests we luckily switched over to another scanning profile and then the i4200 scanner then worked perfectly. This was fortunate because we now knew it had to be a software configuration issue, not a scanner hardware fault causing the U8 error. We were able to compare the scanner profile that worked to the scanner profile that didn't. We noticed that the bad scanner profile was set to use multi-feed detection with the parameter value set to = Both. Both means that the scanner uses both the ultrasonic detector and paper length detection methods. When we set the bad profile to use multi-feed detection using just the ultrasonic detection only, the scanner worked perfectly. with no U8 error. When we set the bad profile to multi-feed detection using just paper length detection only, the scanner gave us the U8 error. Closer inspection of the paper length setting revealed that the length was set to exactly 11.69 inches (i.e. the exact physical length of A4 paper). In a scanner that has scanned 1000's of pages the motor and rollers may cause a slight delay in scan time, which may easily result in the scanned image being between 3 to 30 pixels longer than the physical paper length. This causes the scanned image to exceed the physical paper length (A4 11.69 inches) and hence triggered the multi-feed paper length detection logic to stop the scanner with a U8 error on it's display. To fix this issue you just need to allow a bit of 'wiggle' room in the paper length detection setting. Increase the value by no more than 5% than the physical paper length. We set our paper length detection figure at 12.00 inches (approximately 3% wiggle room) , retested and the scanner no longer stops with a U8 error. Whether you have a Kodak, Fujitsu, Canon or other brand of scanner it would good advice to remember to always set multi-feed detection paper length detection to 3%-5% longer than the physical paper length. We spoke to Kodak and they told us they prefer to use an +5% added to physical page paper length. For example when scanning A4 pages in portrait setting the paper page length detection figure to 12.27 inches (i.e. A4 paper length of 11.69 inches + 5% extra being 0.58 inches) will help stop the scanner giving excessive multi-feed detection errors just because of slight variations in scanned image page length due to any delays in feeding paper throw the scanner (due to scanner age or usage). This should save you putting in a service call for paper jam errors, when the real issue is just the scanner configuration settings. It is sometimes cost prohibitive to put scanners on every employees desk in the Records Department or the Finance Department. Some customers find it beneficial to share scanners between 2-3 employees seated in the same work area. 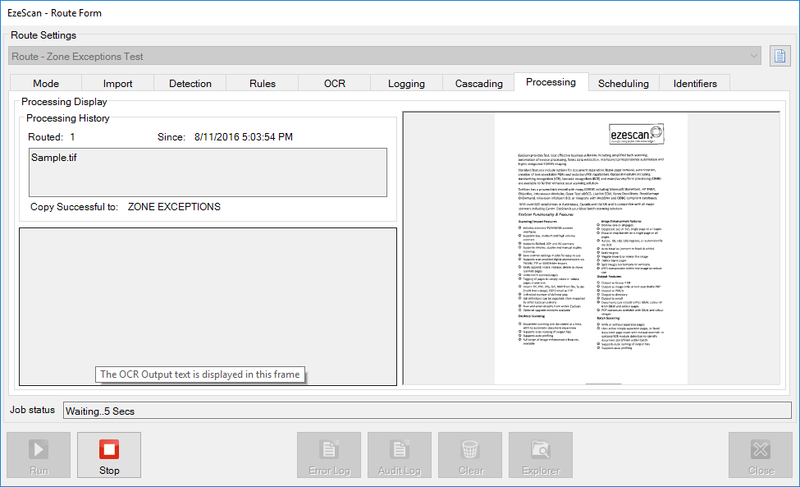 For customers used to using TWAIN drivers with their scanners Quest Software sells a scanner sharing application called RemoteScan. EzeScan v4.3.71 has been tested with RemoteScan v9.748. Higher versions of EzeScan and higher versions of RemoteScan should still be compatible. Our recommended method of installing and testing the RemoteScan software is as followed. 1. Decide which PC is going to run as your RemoteScan Server PC. This is the PC that is going to be connected to your scanner. It needs to be powered on at all times when client PC's want to use the scanner. 2. Connect the USB cable between the scanner and the RemoteScan Server PC. 3. Connect the scanner power cable. 4. 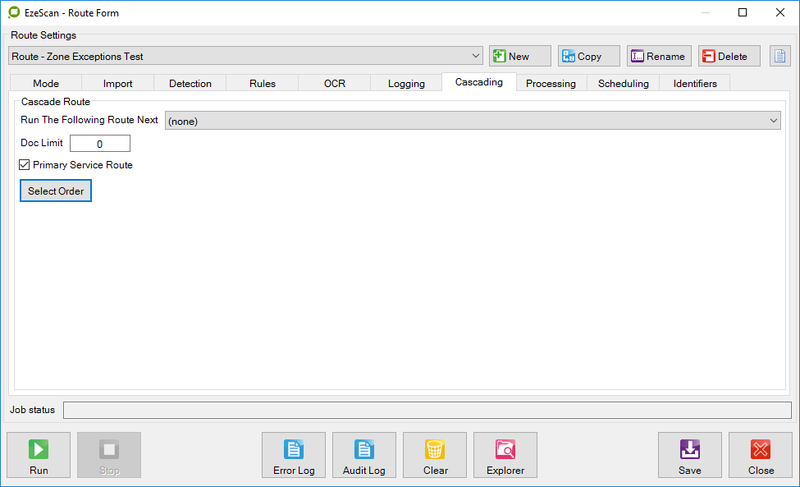 Install the TWAIN driver for the scanner onto the RemoteScan Server PC (e.g... we used a Kodak I2900 driver available from Kodak Alaris download website). 5. Turn on the scanner. Test that the scanner works okay on the Remote Server PC using the scanner application that came with the scanner. 6. Install the RemoteScan Server component onto the RemoteScan Server PC. This adds a new RemoteScan Server v9.748 icon to the windows hidden icon menu. 7. Right click on the RemoteScan Server icon in the Hidden Windows Icons menu. The following menu is displayed. 8. Use the 'Choose a TWAIN Scanner' option to select the TWAIN driver for the scanner you have installed. 9. Press F2 and right click Options to display the RemoteScan Server options. Note: Pressing F2 enables you to change some admin settings that are normally disabled if you haven't pressed F2. 11. If you are scanning lots of colour documents you might like to consider using 'Lossy Compression' instead of lossless compression. This will speed up the scanning process. 12. You might also like to turn on the 'Continue to Scan while Sending Pages' option. This will speed up the scanning process. 13. Use the RemoteScan Installer to install the client software onto each PC that is going to be sharing the scanner that's installed on the RemoteScan Server PC. This installs the RemoteScan (TM) TWAIN driver to each PC. Note: There is no need to physically install the actual Scanner Vendor scanner drivers on each client PC. 14. Install the EzeScan Desktop application onto each client PC. 15. 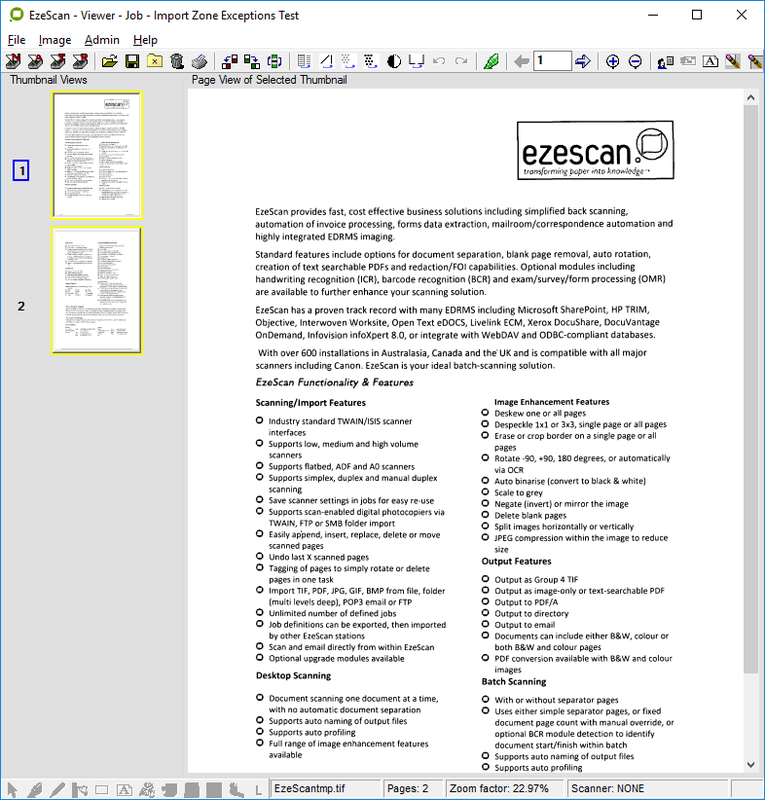 Configure a new scanning Job in EzeScan and set it to use the RemoteScan (TM) TWAIN driver. 16. Test that the scanner works okay by using the RemoteScan TWAIN UI. To do this un-tick the job 'Use UI Settings shown below' option.